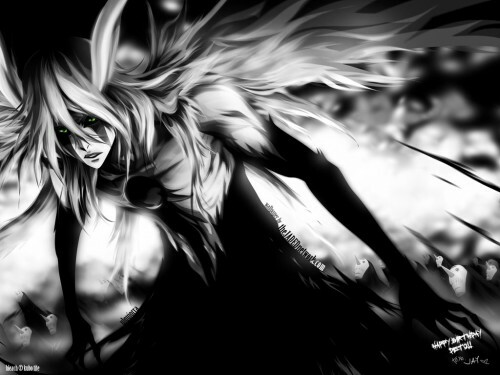 Minitokyo »	Bleach Wallpapers » Bleach Wallpaper: Ulqui-guy!! Well, I haven't submitted much of anything to MT in a while...figured it was time to get a little more active? ._. Ulquiorra's form probably not much of a spoiler now, so I figure it's fairly safe...for manga-readers anyway. Ecit: Oh, and here's a before-and-after, if anyone's interested. It hasn't been too long since our last monochromatic piece got highlighted, but this one illustrates a distinct departure in terms of style. Packed with depth and detail, sjade's wall expertly crafts a stark contrast between the harsh black background and white foreground. While she is able to successfully incorporate both superb lighting and unbeatable technique, the real mark of talent shows through in the strong, well thought-out composition. Even the deliberate use of blur on the outer edges creates focus for the center and movement throughout. Drawing from a manga-inspired style, sjade is able to carry the sense of epic from the original spread while imprinting the piece with her own sense of style. Proposed by vitaamin and highlighted by fireflywishes. *__* You finally submitted it here! Your wall is pure love. I was using it as my desktop for ages. Holy *bleep* that's amazing. This is some awesome vectoring skill. I am in awe of your ability. Great work. holy **** it'a amazing! i love evrything! hair,bg,eyes EVERYTHING! The entire thing looks so soft <3.I love the way how you added the Menos in the back and blended them in! Glad to see the awesomeness here too. Very impressive ! Congrats ! that is just waaaaay too badass!